--> Fly’s 30+ feet in the air! 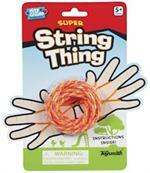 Super String Thing from Toysmith is the classic game of cat's cradle. Fun for one or two players. Instructions included. Ages 5 and up.